The financial complexities of divorce may seem daunting, and we have the experience and track record of success with hundreds of couples to ensure you're in good hands. An initial meeting where we can learn about your situation, answer any questions you have, and get clarity on the desired outcomes of each party. At that meeting we’ll give you a list of documents to provide to us and client data sheets to complete. Individual sessions are scheduled with each party to discuss your interests and give you some coaching on how to make mediation the most successful. You also have time to gather your relevant documents to provide to us via secure, online shared storage. Now it’s our turn. We will complete all of the data entry, analysis, and report preparation for a joint negotiation meeting. Document preparation and filing by our Certified Legal Document Preparer. The entire process can be completed in as little as 4 weeks…seriously. And you never see a judge or a courtroom. 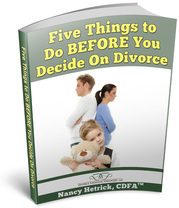 Save money by using a Certified Divorce Financial Analyst, Nancy Hetrick and Smarter Divorce Solutions to mediate your divorce. **Our fees only increase when we can save you more money! Work with the only professionals in the divorce realm that can actually give you advice on the smartest way to structure your settlement so that both of you get to keep more of your own money. Our pricing is transparent, flat-fee pricing based on the complexity of your finances. Schedule your Strategy Session today so your divorce won’t result in financial devastation. When you decide to retain our services, the Strategy fee will be credited to the cost of engagement.